Mapping the byte locations of the headers is the most involved part of the loading process. It is possible that your data may have its values in unusual locations or formats in the SEG-Y files. The SEG-Y Loader will attempt to identify the most likely positions, but to correctly import your data, these must be confirmed. It will display a warning if it detects an unlikely value mapped to an important data, i.e. number of samples (ns), sample interval (dt), first sample delay (delrt), Common Midpoint (CMP), X or Y. This allows you to remap the headers before proceeding to the next step in the wizard. Note: If you are loading SEG-Y data that is exported from Kingdom, you must change the byte location for this field to "105" as Kingdom writes this information at this byte location. Note: Number of Samples and Sample Interval must accurately match the input SEG-Y. If you want to load only a subset or resample the data, changing the values for Number of Samples and Sample Interval will cause you to have wrong results from the loading. Currently, you cannot use the SEG-Y Loader to resample or vertically clip the data. However, you can do these in Insight when you export the volume. 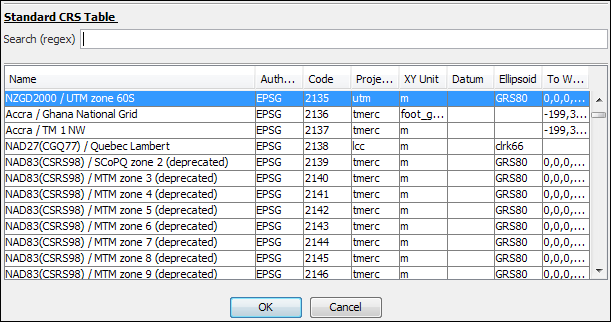 See Exporting a Volume to DUG I/O and Exporting a Volume to SEG-Y for more details. 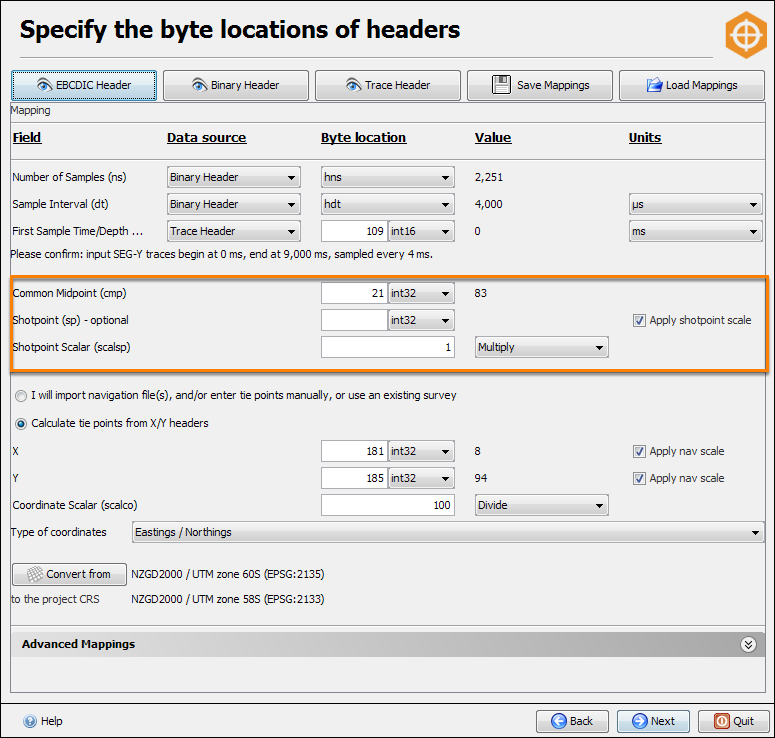 When loading 2D data, the Common Midpoint (cmp) header is used as the primary trace counter. The default value is usually correct. Optionally, you can also define the Shotpoint (sp) header and Shotpoint Scalar (scalsp). Click the Apply shotpoint scale check box to apply the scale to the shotpoint. Note: You can still map to some other value (e.g. a shotpoint number). However, in Insight, it will be displayed as a CMP value. 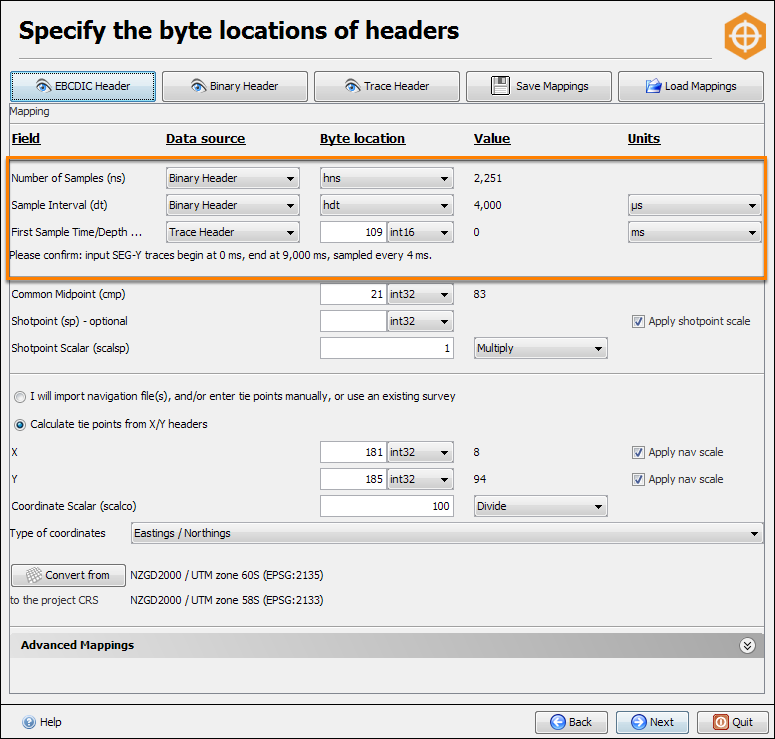 I will import navigation file(s), and/or enter tie points manually, or use an existing survey — Select this option if you have already created a survey (when loading a previous volume) and this data belongs to the same survey, or if you wish to import navigation file(s) (see Loading Navigation Data Files). Also select this option if you want to provide the tie points that define the relationship between CMP in regards to X/Y points. With this option, you do not need to remap the X and Y headers. Calculate tie points from X/Y headers — By default, this is the option selected when you load 2D data. 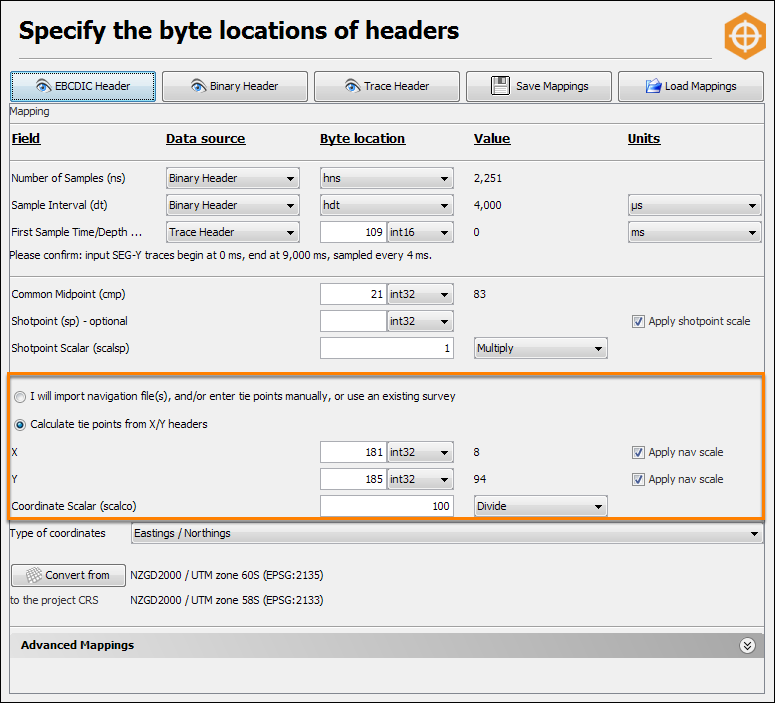 With this option, you must map the X and Y headers that contain sensible data. The standard locations for X and Y are bytes 181 (ENSEMBLE X) and 185 (ENSEMBLE Y), but it is also common to find these values at bytes 73 (SX) and 77 (SY), or 81 (GX) and 85 (GY). These values are usually encoded as int32, but in rare cases, they may be encoded as floats or IBM floats. Analysis will track every CMP/X/Y point in the line. Once it has tracked the entire line, it removes as many unnecessary tie points as possible without introducing error in excess of 10 m (this is the default maximum error distance) (see Analysing 2D Data).